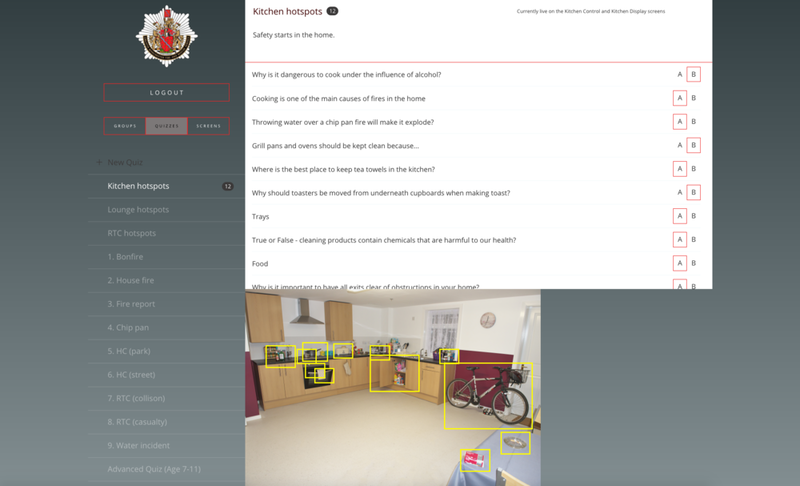 Commissioned us to create some bespoke software for a new training facility in Bury, which would challenge visitors and school groups to learn more about fire safety. The software had to give staff members a way of creating quizzes, deploying them to any of the 7 different areas around the site and then analyse the responses that were gathered. Each area of the site had a different piece of hardware for interaction - some Linux based touchscreen, some Windows based touchscreen but mostly android tablets. The main theatre at the site allows up to 20 visitors to experience a quiz which is deployed to their tablet by a member of staff, or facilitator which guides their group on their visit. The quiz is timed and can be used in an automatic setting, but also can progress manually to ensure that no visitors are left behind. The control tablet is shown which tablets have completed each question, and which are still considering an answer. Some of the questions are image based, some can be text based, and in the Control Room, we give each visitor the chance to respond to a 999 emergency call via their tablets. The software also gives the staff at GMFRS the ability to download an excel spreadsheet which enables in depth analysis of each visitors responses, so that they can facilitate deeper learning, and give teachers or parents ideas on how to further understanding of good fire safety. To find out more, or request a demonstration of the software please contact us. The homepage for the bespoke application created for Bright White Ltd and the William Heath Robinson Museum. 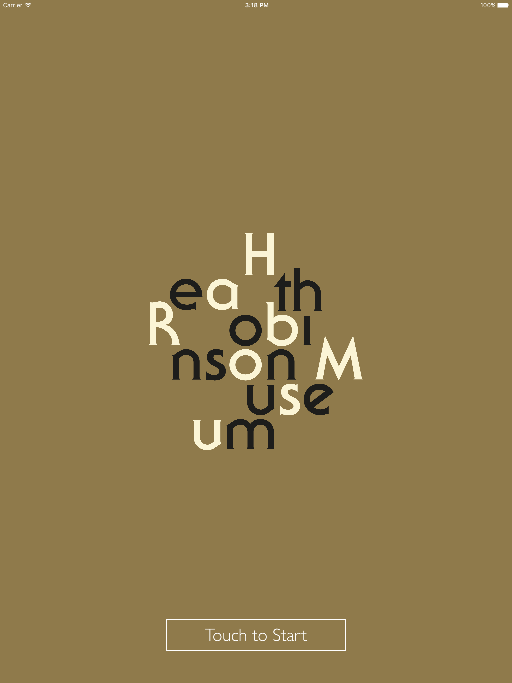 Bright White Ltd commissioned us to create a really stylish piece of software for a new museum in London that celebrates the work of William Heath Robinson. The software runs on iPad Pro devices that are mounted within the museum and has the ability for museum staff to request content updates and modify images with our assistance. Working alongside RS Heritage, we delivered a really great touchscreen project for the Weald and Downland Museum. The design was created by Jonathon Potter Associates, and we facilitated the programming, liaison with the client team, remote testing, deployment and maintenance. The software is designed to run in portrait format to enable a large amount of portrait pictures to be displayed full screen, whilst allowing users to engage with swipe and pinch commands in the same way that they would with a smartphone or tablet device. The client requested the ability to update content themselves, adding more depth the the available information to give them more time for staff to gather background for the huge amount of resources that they wished to use with the touchscreen. We created the software to run in Linux, and a custom CMS system enables the client to deploy updates even though the site has limited access to wifi. Commissioned by Imagemakers UK to create a touchscreen for their client at Axminster Heritage Centre, we assisted with design, layout, technical suggestions, programming, testing and commissioning, remote updates and hardware supply. The touchscreen allows users to search through a bank of content related to each historically important carpet that was produced by Axminster, and where in the country it was sold to. The touchscreen contains a bespoke CMS which allows the client to make updates to each detail, add new sites, upload images and modify existing content. This can all be done via remote login with internet access, or via the use of a USB key. We supplied all hardware and delivered the fully tested and working touchscreen to the client in the south of Devon.